EDUCA is a non-governmental organisation based in the city of Oaxaca. It was founded in 1994 and conducted as a civil association since July 1994. EDUCA is a non profit organisation fostering democracy and development in Oaxacan communities, promoting justice, equality and social participation in order to achieve an elevation of the quality of life for marginalised sectors of the population in Oaxaca. Since its initiation, EDUCA has been advising organisations and communities in the defence of their rights as citizens, especially in indigenous regions, by promoting civil education, training indigenous authorities and supporting local development projects. The organisation’s activities focus on strengthening the political prominence of social and community organisations in Oaxaca, deriving from the articulation of civilian initiatives defending their territory, and to make visible citizen agendas, through an integral focus on human rights in order to influence a profound democratic transition. Some of the most important projects and work that EDUCA has promoted are the following: Municipal School Oaxaca (1999-2008), Network of Solidarity Economies „Guesa“ (2002-2010), Electoral Observation in Indigenous Regions (1995-2004), Constructing Local Power and Indigenous Citizenship in Oaxaca (1999-2005), Diagnosis and Training in Gender Equality (2002), Community Leaders Peasant School (2004-2008), Social and Political Inclusion in Indigenous Municipalities of Oaxaca (2004-2006), Our Rights our born from our Roots (2007-2009), Citizen agenda for legislative advocacy in Oaxaca (2009-2011), “Community Defenders of Oaxaca: Making visible and defending human rights” (2012-2013) and “Participation of women and indigenous communities in the defence of human rights and democratic change in Oaxaca” (2013) among other important projects. Since 2006 EDUCA has been advising the Council of United Communities in the Defence of the Rio Verde (COPUDEVER), composed of indigenous peoples of 5 municipalities and more than 25 communities along the coast of Oaxaca, who actively defend their territories in the face of threats of the construction of a hydraulic dam by the name of ‘Paso de la Reina’. EDUCA implements actions of public and legislative advocacy, highlighting its presentation of the preliminary draft of the Citizen Participation Law for the State of Oaxaca before the Local Congress (2009). 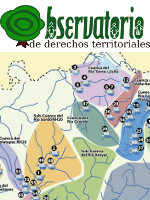 In February 2011 EDUCA presented the document „20 Treaties for the Political Reform in Oaxaca”. The approaches and visions of this document were considered in regards to the Constitutional Reform approved April 6th, 2001 by the LXI Legislature of the Oaxacan Congress. During 2012 the enactment of the Oaxacan Law in Defence of Human Rights and the reform of the electoral code of Oaxaca in regards to normative internal systems, were both endeavours achieved in conjunction with civil society organisations. The department for the defence of territorial rights proposes the strengthening and consolidation of leadership of social, regional and community organisations that fight for their right to territory, as well as the generation of alternative proposals to current development policies. This department trains in the access and use of information sustained on the economic, social and cultural impacts of the investment projects in Oaxaca. In addition to this it generates alliances with municipal and agrarian authorities, base organisations and movements defending land and territory. The department of advocacy works within a legislative agenda and government programs, in order to develop policies that guarantee the exercise of the rights of the population and strengthen a democratic regime. Similarly it aims to generate and strengthen alliances and articulations with organised civil society, to position the citizen agenda and construct social strength from this action. The central purpose of department of communication is to strengthen the social processes that accessorise and accompany EDUCA, from the strategic use of information to the appropriation of tools and citizen media and communication. The work in this department aims to project EDUCA as a referent of public opinion and make visible the citizen agenda in Oaxaca. From this action alliances are also generated with media and communications, informative content is elaborated, analysis and systematisation is promoted and a public dialogue with various actors of society is instigated.